Platform: "Embracing the Special Needs Child!" I am a military wife of 18 years to my husband Jeffrey. We have two beautiful boys Kenny and Cody. I am a full-time Mom and Fitness Instructor with a Bachelor of Science Degree in Exercise Science from Eastern Washington University. My hobbies include dance,running, golf, snuggling with my boys and volunteer work. I currently volunteer 10-15 hours a week in my community as a Cub Scout Leader, Assistant Coach, PTA Mom, Room Parent, PAVE (Partnerships for Action, Voices for Empowerment) Volunteer, TSA (Tourette Syndrome Association)Volunteer, Operation Homefront Volunteer and Precinct Committee Officer. However, my true passion is being an advocate for my sons who both have special needs and educating other parents on how they too can be their child's number one advocate. My oldest son Kenny has been diagnosed with Tourette Syndrome while my youngest son Cody has been diagnosed with Autism. My husband and I work hard as a team to make sure we take leadership roles in their development whether it be their spiritual, physical, mental, emotional, social and academic well-being. I consider myself truly blessed to experience the "Special" in Special Needs! 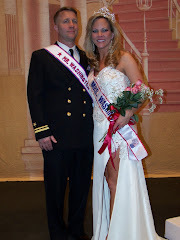 Click my picture above to be connected to the Mrs. Washington America Website! Mrs. Washington 2010 Top Eight & Crowning! My son Kenny asks me "Mommy, why do I have to have Tourettes Syndrome and why does my brother Cody have to have Autism? Why can't we just be normal?!" My reply as his Mother..."Honey, God never intended for you and your brother to fit in, He intended for you and your brother to stand out! God has a plan!" Help Keep Music in Our Schools! Click on the MENC Logo above to find out more info. 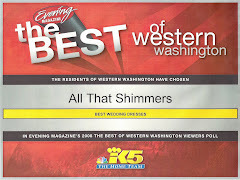 All That Shimmers - Winner of Best Wedding Dresses in Western Washington! My sponsor "All That Shimmers" was selected as the 2008, 2009 & 2010 1st place winner of the Best Wedding Dresses of Western Washington by King 5 Evening Magazine! If you would like to become a sponsor please email carlacrichards@yahoo.com and type Sponsor in the subject line. 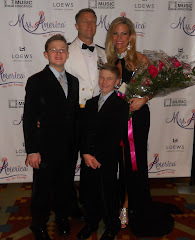 As a sponsor you will be recognized on this blog site and in the 2010 Mrs. America Program. "The Traveling Tic" Blog is Launched!